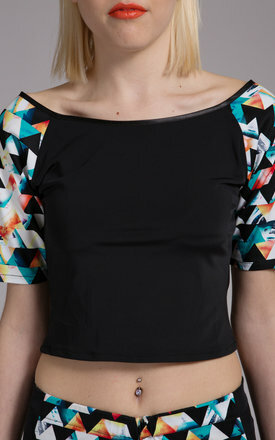 The No Fixed Abode black soft stretch crop top with geometric multi-colour patterns down the short sleeves for a flattering affect. Geometric bright triangles of red, orange, green, yellow and turquoise colours. The cut is tight fitting. The latest look for cool urban city girls by day or by night. Made in London, England by No Fixed Abode.